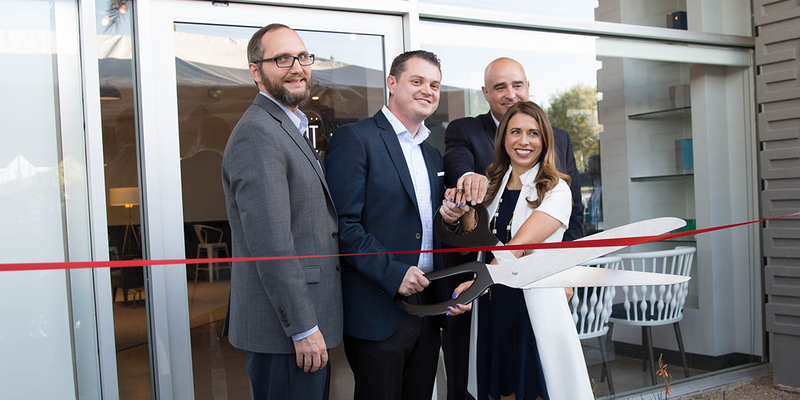 Ideas Collide, a full-service strategic marketing firm, celebrated the grand opening of their expanded and fully redesigned creative studio Thursday, April 20th. The renovation preserved the unique 1961 mid-century modern building near 60th street and Indian School Road in Scottsdale, Arizona and features iconic, exterior breeze blocks with modern patterned zigzag beams. Guests were treated to live demonstrations of the future of marketing. These strategic, forward thinking solutions included chatbot technology, 360° videos—which Ideas Collide develops, shoots and edits—and marketing automation solutions using Oracle’s Eloqua platform with turn-key dynamic content and smart nurture paths. Friends, partners, and team members came together to celebrate the grand opening of Ideas Collide's redesigned space. The expansion and renovation of the current office space was in response to a growing client roster and the addition of new talent and services. The new working space encourages and inspires collaboration while providing an openness for innovation. The space includes a dedicated video production studio with multiple editing bays built for state-of-the-art 360° videos, a photography loft for in-house photo shoots, an amphitheater for presentations and screenings, a large community space and other modern features. The evening’s highlights also included the latest expansion of the agency’s philanthropy program, IC Gives, which has invested more than $750,000 in monetary donations and in-kind services to local community charities, non-profits and startups since 2005. During the event, Ideas Collide recognized and donated over $11,000 to the Local First Arizona Foundation, Playworks Arizona and the Arizona Humane Society.